In Gunpoint player take the role of a private investigator who has been hired to find a murderer. 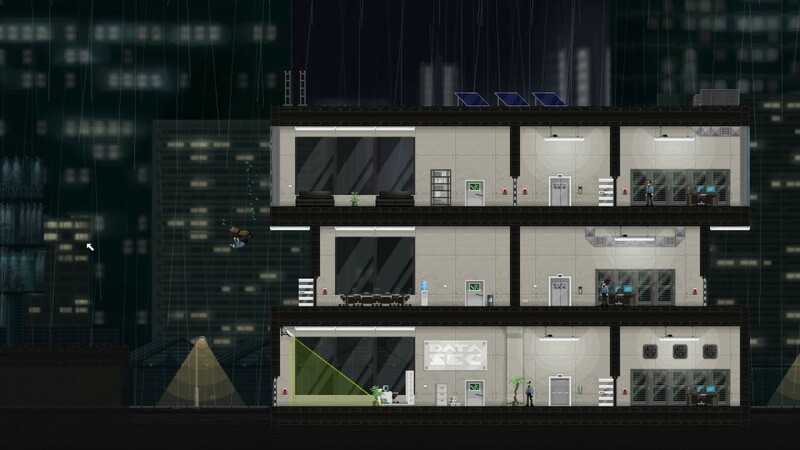 Players must infiltrate buildings in an attempt to retrieve secret documents, video tapes, email correspondence, and much more. As the game progresses the player is able to purchase tools to aid them in their endeavor. The player is able to perform acrobatics in the form of jumping, clinging to walls and ceilings, and tackling. 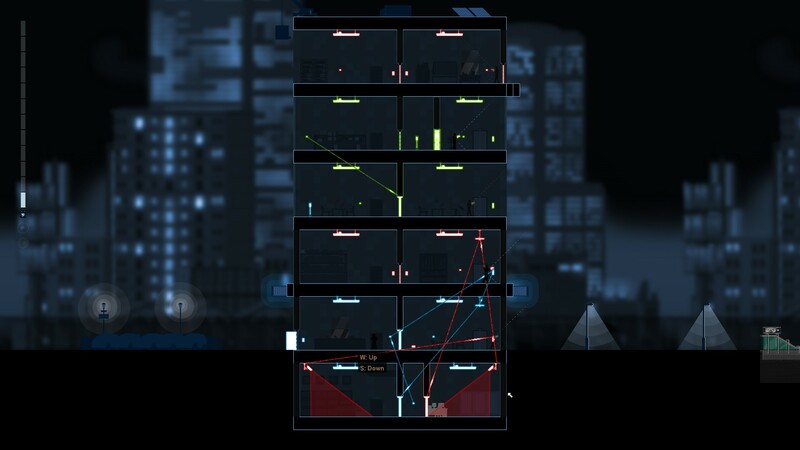 Players can, and must, also rewire the electronics in certain buildings in order to proceed. This can be done in multiple ways. Players can wire light switches to devices like elevators, doors, security cameras, and even enemies weapons. As the player progresses they begin facing increasingly complex security systems. Eventually the player cannot simply hotwire anything they feel like and must bypass additional security systems to gain access to subsequent systems. The player faces the challenge of using the guards in buildings as pawns and they must also figure out how to gain access to closed circuit systems. In addition to the main objective in every mission there are also sub objectives that increase or decrease your reputation with your clients. Some clients will want you to avoid violence completely during a mission while others will want no witnesses left alive. Since Gunpoint is an espionage game the player is able to complete missions without ever being detected if they desire. Explain the screenshots and all of the relevant information on them. Figure 1. Tackling a security guard out of a 3rd story window is pretty typical. Figure 2. Crosslink allows players to rewire the level. Utilizing the crosslink can have some amusing and irritating consequences. Try linking multiple things together to create automated systems that do the work for you. Players can turn off lights to draw a security guard’s attention. This is very useful for ambushing them and knocking them out. Buff guards can’t be pounced on or killed with doors, try locking them in a room and removing their access to the hand scanner on the door, otherwise, they can be killed with a shorted out light switch. Sound detectors and movement detectors can be used to link systems of different colors together, not directly, but it is possible. Since players do not have an ability to attract guards other than being seen (which usually results in death) sometimes taking out a certain guard can completely break the level. The game could benefit from some sort of attraction ability, like knocking on a wall. Sometimes it seems that the levels are designed in such a way that if the player takes out certain guards the level is unable to be completed, this can be frustrating since there is no way to restart a level unless the player dies. If all guards are dead/disabled and the player cannot progress without one alive, they have to abandon the level (which can only be done twice). Providing the player with an option in the menu to restart a level would be beneficial. I found the jumping charge-up mechanic to be clunky at first but once it was fully upgraded I found it to be significantly more useful. Maybe players should just have fully charged jumps all the time and make the distance relative to the suit upgrade only. Thank you everybody, I will keep working on more game diary entries and providing the best info about the games that I possibly can. As far as the browser compatibility issues are concerned, I am unaware of any issues relating to IE since I typically view the site in IE and have had no problems. I am unsure of how to resolve any current issues viewers are having but I will go over the settings in an attempt to resolve any issue. Thanks! It is the free Harmonic theme from wordpress. Hope it helps!